Biodiversity is the total number of existing living organisms and their variation on the earth. The biodiversity of a place indicates bacteria, gene, living beings, and ecosystem existing in per meter square of land. There are three different classes of biodiversity. They are species, ecosystem, and genes. Species means different types of animals, vegetation, crops found in the ecosystem. They include living beings and vegetation like man, elephant, birds, wheat, potato, etc. In Nepal 0.03% of species are available. Species denote the number of group of living beings according to their similarity. Eco-system is the biological community of interactive living beings in their natural setting. Living beings survive according to their capacity and adaptation. Biodiversity is the result of the structure of the ecosystem, too. Gene is a heredity character of living beings which is found in the nucleus of the living cell. It controls physical characteristics, growth and development of living being. They change and reproduce themselves. They are passed on from one generation to another. The diversity within the ecosystem is the diversity of habitats and life of form within the system. It also refers to the type of ecosystem found within a bio-geographical or political boundary as it may be further referred to the variety of the ecological regions- The Terai, The Mountain and The Hill ecosystems. There are 118 ecosystems in Nepal. Similarly, 75 types vegetation and 35 types of forest recorded in Nepal. In Nepal, there are all types of ecosystems except desert and ocean ecosystems found in the world. Various plants and animals of the earth have some kind of variety even among themselves. This variation is due to the ‘gene’, which is found in the nucleus of the body cell. Genes carry the hereditary characters from parents to offsprings. Therefore, the genes have contributed maintaining the biodiversity. Species, as a unit, is used to classify the millions of life forms of the earth. Each species is distinct and different from another species. A group of individuals which can interbreed or attract to interbreed each other is known as species. Monkey and tiger are distinct species, as cows and buffaloes. Species diversity refers to the frequency and variety of species within a specific geographical area. There are 153 species of different crops, 92 species of cereals, 42 species of paddy, 26 species of wheat,15 species of maize.There are 364 weed species, 500 species of edible plants, 200 plants species, 100 varieties of major fruits, 200 vegetables and 10 varieties of potato. Biodiversity means to have different types of species or ecosystem in the given region. Agricultural production, plant and animal production, natural source and scene, tourism and economic development, study and research, etc are some of the importance of biodiversity. Species are different from each other due to climate, water, vegetation, temperature and formation of land. Knowledge and information of biodiversity, religious value, conservation law, income generation, etc are some measures of biodiversity. Why is the wet land eco-system important for bio-diversity? The wetland region is always humid and contains the water and vapor required for the animals and plants to continue the ecosystem cycle. The land is beyond the encroachment. Therefore, it cannot be degraded. The constructional works do not take place here and ecosystem cannot be destroyed. Prove some evidences to show Nepal's richness in species. The interrelationship between the abiotic and biotic factors of the environment is ecosystem. If one factor is affected, it affects another. This relationship makes the ecosystem. If an element of ecosystem is affected or if there is loss in any element of ecosystem, the balance of whole system is affected that directly affects life of living beings. Therefore, the loss in ecosystem is the loss of biodiversity. Classify the biodiversity and explain any one. 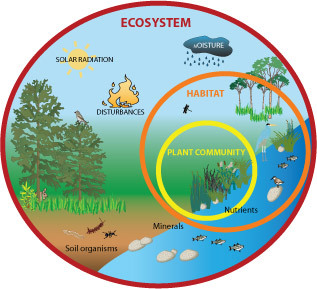 Ecosystem Diversity: Ecosystem is a habitat of living being. Each organism has its own heredity character, which helps them to adopt and survive in their habitat . Nepal occupies 0.1% of land of the earth. The climatic situation, food and habitat determine the survival of living organism. There is about 118 ecosystems in Nepal. People of ______ are involved in horticulture and farming. Importance of bio-diversity is ______. Tiger, Rhinoceros, Deer, Peacock, Crane, etc. are the animals and birds found in ______. Goat, antelope, wild boar, snow leopard, danphe, etc. are the main animals found in ______. Gene is a heredity character of ______. which bird is found in all geographical region of Nepal ? please provide me the species data of 2011 ? What is the name of rare fish of nepal? Any Questions on 'Biodiversity '?